CMNS is a high speed notification system designed for crisis management, information distribution, employee mobilization and first responder communication. Using pre-designed templates and stored databases, the system quickly contacts all individuals on the list via emails, mobile SMS texts, or recorded voice messages. The messages provide response information and instructions. When received, the recipients reply to the CMNS for tracking in the exclusive “Who’s Missing” reporting system as well as the system tracking reports before reporting for duty. Why Do I Need It? In business disruption scenario’s (snow, power outages) and disaster situations, it can be chaotic to track down key employees which are key for recovering the organization. Why OGO? CMNS is integrated into the BCP software solution and provides for quick access during a recovery. With an easy to use interface, CMNS allows you to quickly execute your crisis communication plan. Remember, quick and accurate communications can save lives! Relying on call trees or even website updates can cost you valuable time during an incident. With two-way communications built in, employees are able to acknowledge and/or respond to the incoming message giving you the information you need to assess the situation and take appropriate recovery action steps. Having a great interface is one thing but the functionality must meet the needs of your crisis management team. 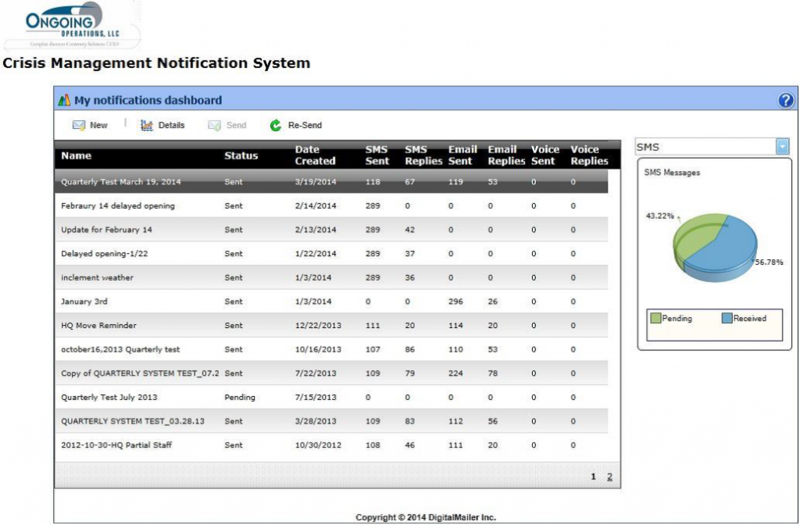 When researching crisis management notification systems look for features as described below.